Are you pregnant and going on a “babymoon” soon (taking a vacation before your baby is born)? If so, a new warning might interest you. The Aedes aegypti mosquito responsible for transmitting Zika. Recently, the Centers for Disease Control and Prevention (CDC) issued travel warnings for pregnant women visiting Mexico, certain countries in the Caribbean including the U.S. Virgin Islands and the Dominican Republic, and South American countries — because of the Zika virus. 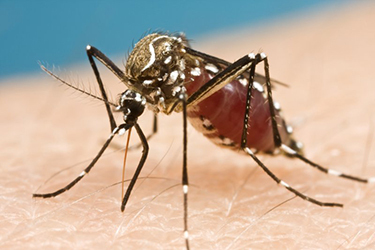 The Zika virus is most commonly spread to humans when an infected mosquito bites. There have recently been reports of the virus spreading through sexual contact. In an adult pregnant woman, the virus generally flies under the radar because about 80 percent of those infected don’t have noticeable symptoms. Those who do have symptoms might have fatigue, rash, joint pain, red eyes, and fever. This virus, however, has been linked to a severe birth defect called microcephaly. Microcephaly literally means “small head” and can be related to developmental delays, hearing and vision problems, and seizures. We don’t know if newborns who were infected with the Zika virus while in the womb definitely will have developmental delays and other problems related to their microcephaly. CDC recommends that women who have traveled to the affected countries and who develop possible symptoms of the virus within two weeks of their visit should see their physician and be screened for Zika. Their newborn should then be screened after birth if the mother’s test was positive or inconclusive. While there is no known treatment for the virus, newborns who test positive can be carefully followed by their physicians for potential complications related to the virus, such as developmental delays. Unfortunately, many experts believe this virus will spread quickly to parts of North America and South America where mosquitoes are present, including Texas. The good news is that only one particular type of mosquito can spread the virus, and it is the same mosquito thought to transmit the dengue virus, which has had only small isolated outbreaks in the United States. What can you do to prevent contracting the virus, especially while you are pregnant? First, you may want to avoid travel to countries where Zika is already prevalent. Second, wear long sleeves and pants to minimize possible exposure to mosquito bites. Wearing mosquito repellent, particularly with DEET, when you are in an area with mosquitos can be helpful. You can also spray your clothing with permethrin (an insect repellant medication) to repel mosquitos. Lastly, consider working with your community to remove areas with standing water, such as in trash cans, littered bottles, and elsewhere. Thankfully the temperatures are a little cooler here in Texas, and the mosquito population is low for now. Dr. Dimino is a Houston OB Hospitalist and Medical Director of Operations for OB Hospitalist Group.